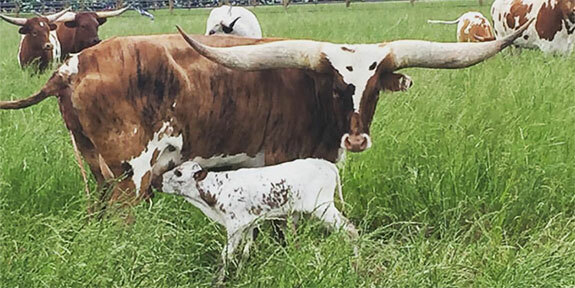 Searching for something unique to add to the pasture of their home, Ron and Heather Thompson sought out a herd of Registered Texas Longhorn. Not normally seen in California, these beautiful picturesque animals have captivated all visitors at the ranch. Being a living symbol of the Old West, many feel their life has come full circle and reminisce of their childhood with cattle. Their color combinations so varied, that no two are alike. Many stare in amazement at the dramatic sweep of their “trophy-sized” horns. We welcome you to Lone Oak Longhorns! Searching for the best in the industry, Ron and Heather purchased cattle from all across the country. Our foundation females have genetics that are provento be consistent and predictable and have worked for some of the best in the industry. Too many recognizable names to list but genetics stemming from JP Rio Grande, Poco Lady BL, Mazue, Lady Monica BL, JH Night Safaris Son, Night Safari BL, Ringleader BCB, and Cowboy Tuff Chex just to name a few. We strive for the ultimate cow, with confirmation, horn, and color.